This article originally appeared in Communication Director on 16 March 2018. Ten of the world’s most inspiring counter-extremism activists decided to take the fight to extremist groups using their own recruitment strategies: Peer to peer communications designed to engage young people. 18 months after joining forces under the banner “Extremely Together – young people coming together against violent extremism”, they were awarded the digital communications award for their outstanding achievements in reaching hundreds of thousand young people. Our Head of Communications, Bijan Farnoudi, shines a light on how a group of extraordinary young people are challenging extremists at their own game. Bjorn Ihler was a teenager enjoying a few days away at a Norwegian youth camp when he found himself starring into the barrel of a loaded gun held by right wing extremist Anders Breivik. Breivik, then 32, killed 77 persons that day, most of them teenagers. Breivik’s shot missed Bjorn who went on to study extremist narratives and how to counter them. Around the same time, several thousand kilometres south, Hajer Sharief was just 19 years old when her country, Libya, descended into a bloody civil war that replaced organised oppression with the unstructured chaos, economic downturn and violence of Libya today. Appalled by the unhinged violence, Hajer founded “Together We Built It”, an organisation protecting women and youth in this increasingly hostile environment. Violent extremism affects young people disproportionately. More than any other age group, the young are both perpetrators and victims. Every attack leaves behind young people who are willing to fight back and to defend the values of unity, hope and pluralism against the divisiveness, hate and violence of extremists. Harnessing young people’s drive to answer the dark absolutism of extremism with tolerance and optimism was Kofi Annan’s starting point for what was to become “Extremely Together”. With his Foundation, Mr. Annan decided to organize the dispersed voices of those youth standing up to extremism in their communities, often at great personal risk, and to lend them political weight and reach beyond their neighborhoods. 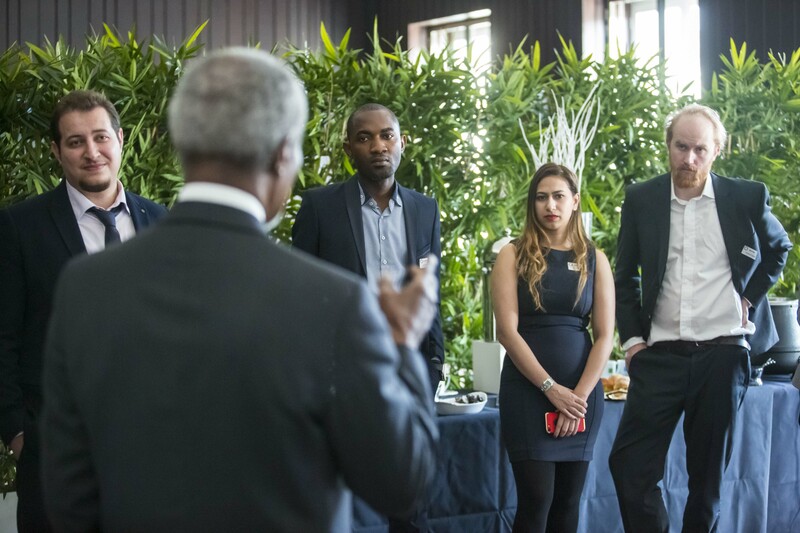 First, our boss Kofi Annan and the team, recognized that young people will listen to other young people first. We selected 10 inspiring counter extremists, including Hajer and Bjorn, and tasked them to write the world’s first guide to counter extremism for young people, by young people. Second, we recognized that, no matter how well-meaning, a report from some Non-Governmental Organisation organization would not make into the heart of affected communities and would not reach the young netizen of today. To break free from the dustiness of UN/NGO initiatives and to appeal to young people confronted with the lure of extremism, we gave the ten their own identity under the banner “Extremely Together”. We wanted to reclaim the notion of “extremism” sending out the message that one can be extremely constructive, helpful and positive. We knew that the guide had to be available digitally, not just as a PDF, but custom made for a scrolling digital native with video content for easy consumption and social media dissemination. The digital guide has a journalistic feel with each of the ten presenting one chapter outlining, a different approach to countering violent extremism. Third, we needed to lend their voices political weight. In return for their engagement, Kofi Annan vowed to throw all of his gravitas behind them, giving them access to the highest political circles, to media, donors and to millions of his followers on social media. With each of the ten functioning not just as the technical expert for the realities on the ground but also as the most effective and best connected influencer to reach their peers, we pursued a strategy of profiling them prominently, giving them a dedicated microsite and their own social media channels as Extremely Together. Their international recognition did not just give them credibility among their peers but also among their local political class. The group of ten has since been invited to speak at ministerial events in their countries, to advise the UN as part of specially formed expert groups on extremism and the like. They have, over the past year, received 7 different awards including the digital communications award and have been covered in media around the world. We created a targeted counter narrative to the narrative of violent extremists, created not by policy wonks in conference rooms, but by youth on the ground and online where extremists actively recruit. As our main spokespersons, the ten young did not parrot wisdoms dictated by highly paid consultants but relayed their own messages born of their own experiences, in a language accessible to their peers. This approach enabled us to enter a space that is for now comfortably occupied by radicals and by extremists without competition, without dissent and without voices that offer hope and unity instead of division, hate and violence. Selecting grassroots activists with knowledge from the real battlefields in their communities and turning them into influencers that reach both the global media and policy makers but also their peers is the missing link in the world’s response to stem the tide of extremism. Our next step will be to scale this approach by recruiting local Extremely Together volunteers to form local chapters, in the places where it matters most: the banlieues, jails, schools. And most importantly: Online. A bit over a year ago, Rod Cartwright, in this publication, wrote about a deep seated global leadership crisis. Most global problems have a ready-made solution but lack the leadership to effect change. Identifying the right leader for the right problem and equipping them with the means to inspire, engage and persuade beyond their neighbourhoods, is empowering, affordable and effective. One does not need to be a President (or a Secretary General) to be a leader: In fact, as Kofi Annan often says, one is never too young to lead.